Entering Saturday’s heavily hyped showdown against Miesha Tate, many believed Ronda Rousey (Pictured) had bumped her gums far too much for someone with merely four professional fights under her non-championship belt. After twisting Tate’s left arm in all sorts of unnatural positions to capture the Strikeforce bantamweight crown, Rousey revealed her Chael Sonnen-esque antics were all part of the master plan. 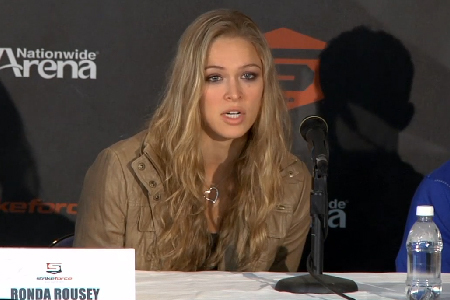 “That’s part of the reason I tried to get in her head so much before the fight,” Rousey admitted. “I felt like if you challenge someone’s womanhood or manhood, they tend to be a lot less tentative and tactical in their matches. They tend to fight more with their emotions than with strategy. Rousey’s strategy worked perfectly, as Tate came out blazing like a house on fire. Unfortunately for her, it didn’t take long for the “Rowdy” one to exploit Tate’s overzealousness and lock in her first armbar attempt. Although Tate was able to escape the primary try, it was a wrap after Rousey’s second endeavor. “I felt like I didn’t quite have it. I was trying to scramble and put it together, but she was aware enough to know the right way to turn to get out of it. I didn’t feel very secure with it,” said Rousey. “She impressed me with how savvy she was on the ground, at least with her defense. In addition to owning the 135-pound crown, Rousey also has an unblemished 5-0 résumé. All of her victories have come via 1stRound armbar tap out.